(Admin) Can GoCo provide employee benefit deductions to me? When your employee enrolls in new hire benefits, completes open enrollment or makes a change to their current coverage, there will be payroll repercussions. GoCo is here to help you track those changes and consolidate all action items into one spot, the Payroll Dashboard. If you ever just want a report of standard per pay period or monthly deductions you can use the Benefit Enrollment Census report. 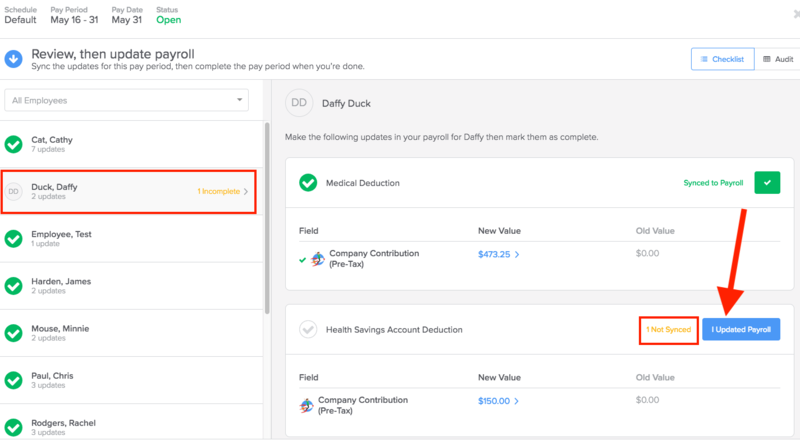 First, your account owner (either GoCo or your Certified Advisor Partner) needs to turn the Payroll Dashboard feature on for you. Ideally, this should take place as soon as you get access to GoCo and before all of your employees have been invited to on-board. Who can access the payroll dashboard? Only admins on your GoCo account (as well as an owner or super-user from your benefits team) can view this dashboard. Check out more information on company permissions here! How do I access the payroll dashboard? How can I best use this feature? Keep GoCo as the source of truth. If employees need to update their address, they change it in GoCo. If employees need to change direct deposit, they change it in GoCo. Hire all new employees in GoCo first. Once they on-board, all their information will be on this dashboard for you to sync over to your payroll at once. Listen to the reminders GoCo will send you. A few business days before each pay period GoCo will let you know via email (and a task) that there are changes to be made. Please check the dashboard and make changes in enough time to run your payroll. What if I notice something that is wrong or that I don't understand? First, look at the Activity log on that employee's profile to see if you can understand when and why a change was made. When in doubt you can always contact the GoCo support team if you need help investigating why something shows up on the dashboard! What information shows up here? Any changes made in GoCo related to benefits and payroll will show on this dashboard. This does not include PTO balances or custom fields. What is a catch-up deduction? If you forgot to sync a deduction during a prior pay period then the employee owes you that money + their current deduction. GoCo does this math for you and will continue to roll it over week to week until you click I Updated Payroll. What if I don't want to sync this all myself? GoCo is here to help! For $3 per employee per month, you can grant us access to your payroll and we can push the changes over for you. Contact help@goco.io for more questions about this.